When I visited Llandegley Common to see the extent of the construction of the wind turbines I carried out some sketching, especially those delightful corners, as well as the beautiful panoramas of this much-loved landscape, now under severe threat. The early morning sunlight lit up the tangled undergrowth at the entrance to the common, a delight for nature-lovers and wildlife. In the ensuing painting I have changed the greens in the main for warmer colours – I do so love the Daniel Smith Transparent Red Oxide, so powerful and transparent. Here I have tried to show the backlit effect of sunlight catching the rims of the trees, and dropping the Transparent Red Oxide into the trunks while they were still wet with the initial green and yellow ochre mixture. Background trees have been rendered with the wet-in-wet method to suffuse them into the distance, even though I could see them in clear outline. The situation with the development at Llandegley Rhos has become appalling: the county council were asked by protesters to stop the developers’ access across the common until they had permission to do so, but the council planners have failed at every turn. They are running around like headless chickens, not knowing what to do, to the disgust of residents and some council workers themselves. One lady living nearby has had a dead fox planted in her drive, its tail cut off – a clear threat. They want these turbines up by 31st January so that they can claim millions for producing absolutely nothing. What other industry works in this way? The Campaign for the Protection of Rural Wales has put in for a judicial review, but will it be too late? It was in by 6th December, the cut-off date, but with the developers working round the clock it may well be fait accompli before the case comes to court. CPRW is only a small organisation, unlike its sister in England, but has shown far more professionalism than the Welsh Assembly, Powys CC or the developers, who have shown arrogance and bullying tactics all along. This is an absolute shambles as far as planning law and local democracy is concerned: it simply doesn’t exist in Wales. Thankfully I shall be spending Christmas in Sussex with my gorgeous little grand-daughter, and I wish you all a very Happy and peaceful Christmas. May you find lots of lovely arty things in your Christmas stockings!!! 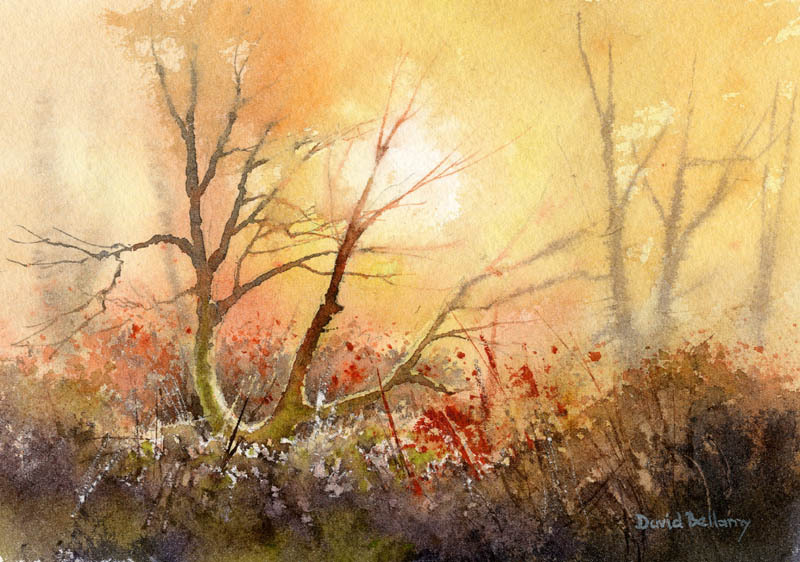 This entry was posted in Daniel Smith Watercolours, David Bellamy, sketching, sketching outdoors, Welsh environment countryside despoilation by David Bellamy. Bookmark the permalink. Wishing you and your loved ones a very Happy Christmas. With all good wishes for the year ahead. Keep those brushes wet. Happy Christmas David and Jenny, you are both an inspiration to all of us. Judith Leatham, West Sussex. I have already responded to Jenny about this on Facebook. Sadly it is aleady probably too late. This type of insanity was driven further home to me today when I read the news that “Nature officials grant licences to shoot some of Britain’s most endangered birds”. We are told to worry about environmental destruction in other ‘less developed’ parts of the world – and yet here we are in the UK, still busily destroying that precious little of the natural world which has thus far survived. Those whom the Gods wish to destroy, they first make mad. Heathen proverb. Dear David,that is a sad and frustrating tale indeed……if unsurprising! There seems to be an inevitability about it but perhaps it is not too late……? I hope you can enjoy a relaxing time with your family and I wish you a happy Christmas and thank you for your blogs.